Android is an operating system built specially for touch screen mobile devices. But since it is free and open source, more and more people are doing amazing things with this amazing operating system. Basically, we know Android as a popular OS for mobile phones and tablets. But now, you can even install Android in your Windows PC or Laptop. The simple way to emulate and run Android in a PC was to install a simple software called Bluestacks. But with this method, you will be able to install Android into your hard drive and be able to select between Windows and Android while booting your machine. What you will be doing is downloading a compatible Android ISO file for Windows and install it as a dual boot using UNetbootin Tool. Users who have installed Linux alongside their Windows installation are pretty much familiar with this process. Click here and download the matching Android x86 ISO file for your system. 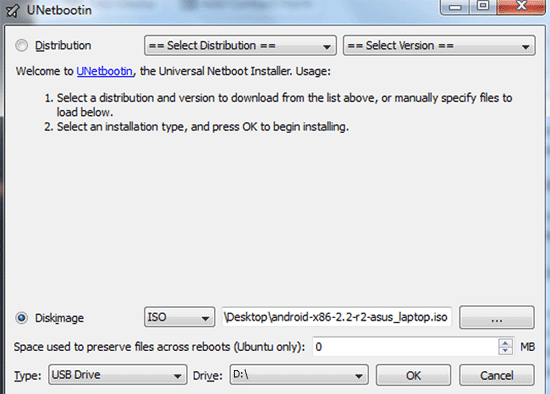 Click here and download UNetbootin, a utility that allows you to create bootable USB drives. Select your USB Drive and hit OK.
Next, with the bootable USB inserted in your USB drive, restart your system. In your BIOS settings, make your USB flash drive as the first choice in booting up your system. You have to boot your system using the bootable USB that you just created. Android installation menu will appear, which you can follow to install Android to your hard disk. Carefully select a disk drive to install Android in. If Windows is installed in C: drive, you might want to install Android in another drive like D: or E: for example. Confirm the steps in the installation process and restart your computer. On the next boot, you will be asked whether to load Windows or Android. Why Install Android in your PC? For testing purposes: seeing how Android would run in your PC. For trying out Android games and apps in your PC. For utilizing the potential of touch screen PC and laptop to use Android conveniently in a large screen.